Three academics from The City Law School have written a book to guide practitioners through the most significant changes to civil justice for more than a decade. The Jackson Reforms seek to ensure that costs in civil cases are predictable and controlled. A key recommendation was to promote the use of Alternative Dispute Resolution (ADR). 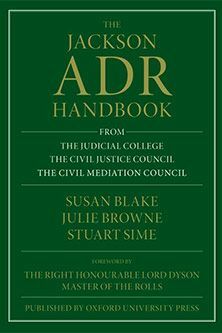 Stuart Sime, Director of The City Law School's BPTC, Julie Browne Deputy Course Director and Susan Blake, Associate Dean were commissioned to write the first practical guide on ADR following the reforms. The Jackson ADR Handbook is designed to take account of the vital role forms of mediation have to play in reducing the costs of civil disputes, by encouraging the early settlement of cases. The report author, Sir Rupert Jackson, congratulated them on an excellent book commenting; "this is exactly what I envisaged when drafting chapter 36 of the Review of Civil Litigation Costs Final Report". "It is properly authoritative. It is readily accessible. I cannot commend it more highly. This book deserves to be the first and only port of call for every student of ADR irrespective of whether they are a litigant, a law student, a lawyer or a judge. I am sure that it will be." "This is an excellent example of the sort of high end, practice oriented work in which members of The City Law School are engaged. The expertise that Stuart, Julie and Susan have invested in this project will be of great value to practitioners as they navigate their way through the changes to civil justice". The handbook is endorsed by Lord Justice Jackson, the Judicial College, the Civil Justice Council, and the Civil Mediation Council. It includes an in-depth overview of the different options and principles of ADR, as well as sections on: the interplay between ADR, CPR and litigation; negotiation; mediation; recording and enforcing settlement; and other alternative dispute resolution options, as well as giving a summary of the international perspective.